While the word "faith" resists the word "logic" at the beginning of Kendall's poem, Faith has its own textual logic by which it progresses, words and letters rearranging to lead on to the next state. This short multimedia piece mingles textual animation and sound effects such that a structure of words sounds as it forms or collapses. 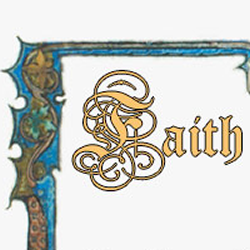 Author description: Faith is a kinetic poem that reveals itself in five successive states. Each new state is overlaid onto the previous one, incorporating the old text into the new. Each new state absorbs the previous one while at the same time engaging in an argument with it. The gradual textual unfolding is choreographed to music. Instructions: Select the appropriate sound settings and turn on turn on the computer's speakers or plug in headphones. After each text is shown, click to continue to the next state. Previous publication: Faith was published in Cauldron & Net, http://www.studiocleo.com/cauldron, in the Autumn 2002 issue.